Today we announced our partnership with Navigant, a global professional services firm with exceptionally deep expertise and experience in financial services advisory and compliance. At the heart of any great partnership is an alignment of capabilities. With Navigant we have just that. Navigant brings a unique set of capabilities to bear. With more 200 clients across financial services, insurance, corporations and government agencies they are on the front lines of financial crime – seeing the challenges in real time and in the first person. As a result, they understand regulation, financial crime, sanctions and compliance as well as anybody. This is a function of the exceptional human capital that they have assembled – true practitioner expertise from the perspective of the regulator and the regulated entity. Add to this deep technical capabilities and outstanding strategy capabilities and you have a world-class firm. Because of these attributes, Navigant understood Ayasdi immediately – from the technology, to where we were applying it, and why it was successful. With this understanding in place our conversations progressed rapidly with a particular focus on the area of financial crime. This is important given the rapidly evolving financial crime landscape. While other areas may be seeing some regulatory relief, financial crimes is not one of them. Political pressures are compounding the regulatory pressure resulting in historic fines, unprecedented operational oversight and other penalties. What was once an oft-ignored back office function is now a first class citizen in a financial institution’s risk portfolio. More importantly, advancements in technology independent of financial crime have raised expectations from the regulator community on performance benchmarks. At the heart of this challenge is the data. 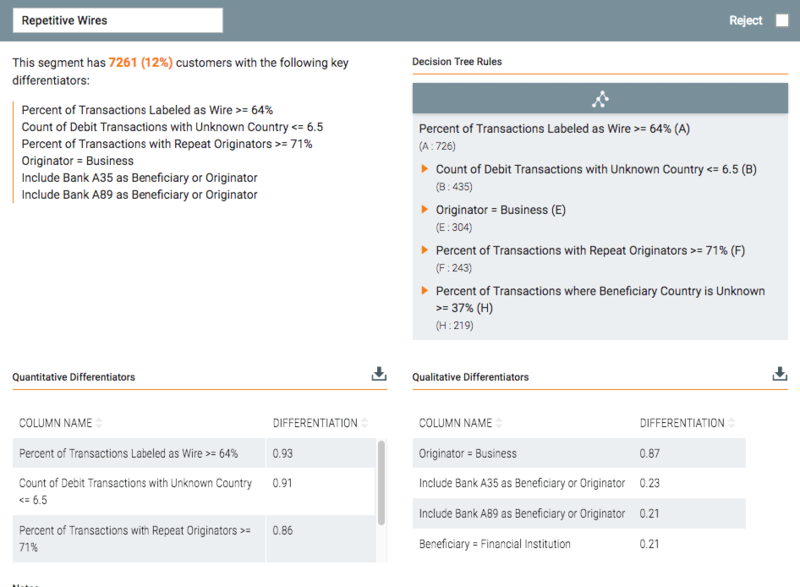 Data on customers, transactions and other risk indicators has become available. The technology to store it is available. The jurisdictional challenges associated with privacy present obstacles, but not barriers. The challenge is combining strategy, process and technology to leverage that data to build an effective and efficient system for financial crimes. From the technology perspective, we see the ability to apply unsupervised learning techniques as critical. Much of what is written on the subject of machine learning and AI focuses on perception and prediction problems. While these are important, they fail to address one of the larger issues – knowing what you are looking for in the first place. This is where unsupervised learning plays a critical role. Whether segmentation, hot spot detection or anomaly detection, these capabilities are the first step to understanding the data well enough to predict off of it. Indeed, today’s advancements in prediction are a function of combining them with one of these techniques. Let’s use a real life example from a major financial institution. Current AML processes typically have hand-coded or, in the case of more sophisticated players, machine-coded money laundering rule scenarios to evaluate each transaction for each geography and type of business. Subject matter experts encode established patterns such as high repetitive number of small transactions (structuring), money flows in and out of high-risk countries, etc. Innovators go one step further and create segments of customers, scenarios and threshold upstream of the transaction monitoring system. The segments that emerge, however, are typically static and coarse since they only take into account a limited set of factors about each customer or entity. Moreover, they are done manually and separately for customer data and transaction data and have trouble effectively capturing the complex feature interactions. By applying sophisticated machine learning techniques like Topological Data Analysis (TDA), the financial institution was able to automatically assemble self-similar groups of customers and customers-of-customers (in trade finance). This exercise was done entirely unsupervised, with Ayasdi’s software making the selection of the appropriate algorithms, creating the candidate groups and creating a starting point for tuning the scenario thresholds. These new groups were assembled in a completely different fashion than the previously constructed groups. The elements that tied them together were different. The way they were distributed was different. One key feature was that the groups were more evenly distributed than the previously constructed groups. While in some sense, the segmentation seems simple, it is, in fact extraordinarily complex. Much of this comes down to features. Ayasdi’s core technology, Topological Data Analysis feasts on features. The more of them, the better. Where other technologies are limited in the number of features they can consume, Ayasdi thrives in feature rich data. To wit, in the case of this institution, Ayasdi was able to consumer 23x the features of the existing technology. The result of this segmentation and tuning was a massive drop in false positives – while capturing every SAR previously filed by the bank. The technology is but one step, however. Accompanying the technology is process change, strategy work, regulator interaction and implementation planning. This why our partnership with Navigant is important. Navigant’s more than 325 consultants and 110+ technologists bring expertise, global reach and execution capabilities to the table and amplify the impact of our technology. Needless to say, we are excited. To learn more about the partnership, reach out to your Navigant practice leader or drop us a note at sales@ayasdi.com and we can make a conversation happen.